What is the DURATION Function? The DURATION function is categorized under Financial functionsFunctionsList of the most important Excel functions for financial analysts. This cheat sheet covers 100s of functions that are critical to know as an Excel analyst. It helps to calculate the Macauley Duration. The function calculates the duration of a security that pays interest on a periodic basis with a par value of $100. DURATION is commonly used by Portfolio ManagersPortfolio ManagerPortfolio managers manage investment portfolios using a six-step portfolio management process. Learn exactly what does a portfolio manager do in this guide. Portfolio managers are professionals who manage investment portfolios, with the goal of achieving their clients’ investment objectives. who use the immunization strategy. Apart from it, the function is also useful in financial modeling, particularly in predicting future cash flowsValuationFree valuation guides to learn the most important concepts at your own pace. These articles will teach you business valuation best practices and how to value a company using comparable company analysis, discounted cash flow (DCF) modeling, and precedent transactions, as used in investment banking, equity research, of investments. Settlement (required argument) – It is the security’s settlement date or the date on which the coupon is purchased. Maturity (required argument) – It is the security’s maturity date or the date on which the coupon expires. Coupon (required argument) – It is the security’s coupon rate. Yield (required argument) – It is the security’s annual yield. Frequency (required argument) – It is the number of coupon payments per year. For annual payments, the frequency is = 1; for semiannual, frequency is = 2; and for quarterly, frequency = 4. Suppose If we try to input text representations of dates into Excel functions, they may be interpreted differently, depending on the date system and date interpretation settings on our computer. 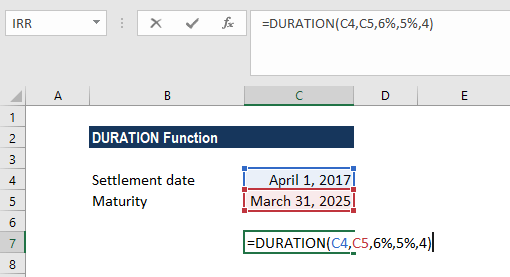 How to use the DURATION Function in Excel? In this example, we will calculate the duration of a coupon purchased on April 1, 2017, with a maturity date of March 31, 2025 and a coupon rate of 6%. The yield is 5% and payments are made quarterly. The function returns a duration of 6.46831 years. Invalid numbers are supplied for the coupon, yld, frequency or [basis] arguments, i.e. if either: coupon < 0; yld < 0; frequency is not equal to 1, 2 or 4; or [basis] is supplied and is not equal to 0, 1, 2, 3 or 4). One or both of the given settlement or maturity dates are not valid Excel dates. In MS Excel, dates are stored as sequential serial numbers so they can be used in calculations. By default, January 1, 1900 is serial number 1, and January 18, 2018 is serial number 43118, because it is 43,118 days after January 1, 1900.